The Roma people of Vlasca a village in southeastern Romania told BBC this story. The Roma here, a traditional metal workers called Caldarasi are closed and inward-looking. They are reluctant to talk to anyone from outside the community. Historians often call it “the forgotten Holocaust”. Up to 500,000 Roma are believed to have died in mass shootings and Nazi gas chambers. Sandu Stanescu remembers how, in the early summer of 1942, some policemen installed a table by the road, covered it with papers and made lists: Roma families, extended families, communities – shatras. The Nazi-backed ruler of Romania – military dictator Ion Antonescu – had just received his reward for attacking the Soviet Union: Trans-Dniester, “the land beyond the Dniester”. It was a chunk of land in the east, between the rivers Dniester and Bug. The territory, most of it part of today’s Ukraine, became Nazi Romania’s ethnic “dustbin” for Jews and Roma. “We lost our carts, horses, all our baggage and all the gold our fathers had hidden in the carts’ shafts,” Mr Stanescu says. “My father, Mihai Gheorghe, died there, my mother Maria died there, both my brothers died there,” says Mihai Gogu. One man speaks of “beatings, disease and bitterness in the fields”. Mihai Iorga recalls how his mother had “brought with her some embroidered pieces of cloth, like those ones people arrange on walls under the icons”. “She tried to sell those in the neighbouring village, for food. But a Romanian policeman and a Ukrainian guard saw her, beat her badly and threatened to shoot her. She rushed back home crying. “Me and my brothers begged her not to go again. But the following day off she went. She did what she did and managed to find another way to sneak back into the village. “We waited and waited, fearing she might never come back… But lo and behold, there she was, carrying two buckets of potatoes and sweet cornflour! Oh, how we hugged her, how we kissed her! She then baked those potatoes straight on the flame because we were left with nothing, not even a pan or dish for cooking. 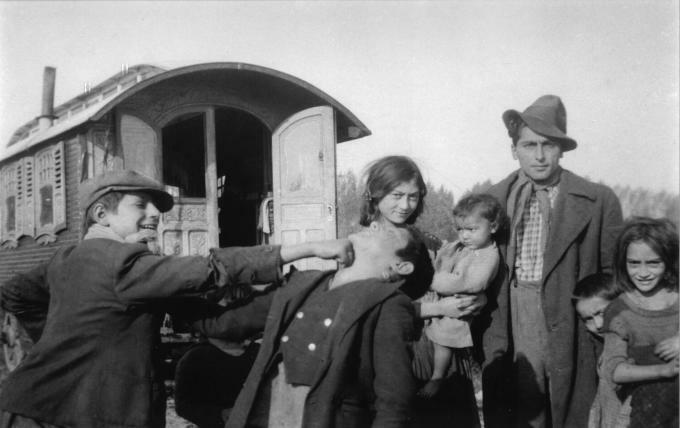 In 1944, when the war front moved west and the Romanian administration withdrew from Trans-Dniester, the Roma had to walk back hundreds of miles, “covered in mud, covered in bitterness”. Mihai Iorga’s father was taken ill and died during the return journey. It was his mother who managed to see her children safely to Romania. “Both my parents died. I was only a girl, in the flower of my youth. That was very dangerous. They tried to take us young girls by force,” says Natalia Mihai. There were horsemen hunting women and little girls hiding under their mothers’ long-layered Gypsy skirts. “Once they put a gun at a girl’s neck and raped her, something like a whole committee raped her and they were shouting and chanting,” says Floarea Stanescu. But Natalia Mihai asks her to stop: “Don’t remind me of all that, I feel like dying”. “Yes,” says Mihai Iorga, “I ate moles too, on the banks of the Bug”. Most of the Holocaust survivors in Vlasca have received compensation via the International Organization for Migration, in Geneva.